Although I made a great leap forward a few weeks ago, by disconnecting our land line and getting a cellular phone, I compensated by becoming a throwback in matters of personal hygiene. No, I still bathe and brush my teeth daily. I mean shaving: I reverted to my grandfather's Gem Micromatic safety razor, after misplacing my Gillette Sensor two-blade. For some time, at the prompting of another friend who questions technology on a daily basis, I was considering "going retro" with my shaving. Moreover, I got angry over the war of escalation in price and numbers of blades per razor (it's spawned a parody of Moore's Law: 14 blades / razor blade by the year 2100!). I dislike electric razors, having used one for nearly a decade in and after high school. So it was back to 1920 for me. I'm also skilled with my grandfather's razor (a pristine version is pictured here); in his last years, I shaved him weekly with it, causing nary a nick. And for 30 years I have used his shaving mug and a brush, after finding shaving creme expensive and wasteful. Being a thick-bearded man of Lebanese descent, I wear a closely cropped beard and have done so for--gasp--33 years. I only shave my throat and cheekbones. This reduces nicking, but I was unprepared for the excellence of a technology nearly 100 years old. Simply put: nothing modern touches a good blade in a safety razor, excepting a straight razor that I won't dare try even with my steady hands. 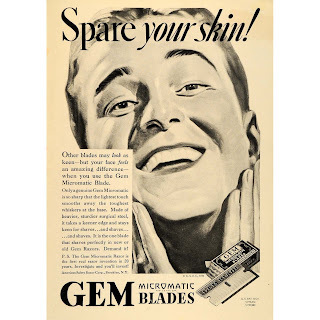 The Internet Museum of Safety Razors: My Micromatic is on the Gem page, if you are so inclined. I rather miss these "Internet 1.0" sites...the museum site was last updated in 2004, alas. Badger and Blade, with a shaving wiki! Classic Shaving (.com). Of course. Lee's Safety Razors: this is my favorite of the lot. I think I'll be buying a second "travel" razor, given that my daily is a family heirloom. Somewhere in the afterlife, my dad and grandfather, clean shaven of course, are having a good laugh and saying "what is the matter with you, boy? You crazy?" Dad was a typical "new and improved 20th Century guy." "Old" meant "toss the damn thing out," to him. My grandfather was more like me, questioning why things change just to make more money for a company already producing a well designed, effective product. But even he would laugh at me for being so sentimental about an everyday object that had served him well for many decades. No, this is not some trend, in my case, spawned by Mad Men. 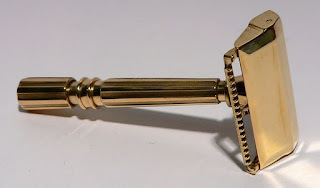 It's the return to an appropriate and sustainable technology after Gillette made shaving ludicrous and most gear has become disposable. You may have noticed that some stores lock down their razor blades to prevent theft. At a dollar per cartridge, it's easy to see why. Single-edged blades are just as sharp, last longer without clogging, and cost half what a Sensor razor blade ran me. Shaving has become fun again. It's more of a mindful and meditative ritual now, which is what using technology should be, in my opinion, to keep one from taking it for granted. I'll soon have a '65 Mustang ragtop back on the road, an old favorite car of my wife's, and from driving her other classic, a '68 Chevy C-10 truck, I can tell you: you do not multitask with antique technology. Eyes on the open road or your precious throat. 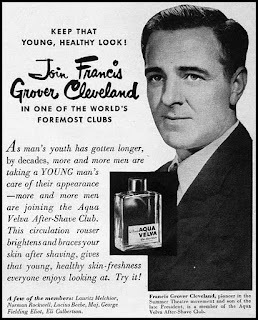 Besides, old-school shaving has all the doo-dads that make antique technology so fascinating: I love wiping the blade clean amid the wafting scent of aftershave, as I prepare myself for the daily grind. I had stopped using aftershave, but now, with such a close shave daily, it refreshes my skin. Moreover, when shaving with antiques one must pay attention to the razor or risk a cut. I'm very good at it, but the focus is zen-like: hai karate! To get away from hairy apes. That's not quite the historical slogan, but it was good enough for me to kindle a life-long interest in the manly art of a good, close shave.